There is a variation, Winter Version, included with the pattern. This variation omits the eyelets and uses slanted ridges instead. This pattern is marked For Experienced Knitters. 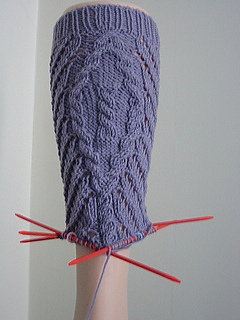 There are several different cables combined with yarnovers for the eyelets. This pattern is worked from charts. Yarn substitution: 2 skeins of Louet Gems Opal, sport weight, 225 yds per skein. Cuff is best worked with US 2=2.75mm not US2=2.5mm as pattern is written.